The main reason U.S. companies are reluctant to step up hiring is scant demand, rather than uncertainty over government policies, according to a majority of economists in a new Wall Street Journal survey. "There is no demand," said Paul Ashworth of Capital Economics. "Businesses aren't confident enough, and the longer this goes on the harder it is to convince them that they should be." 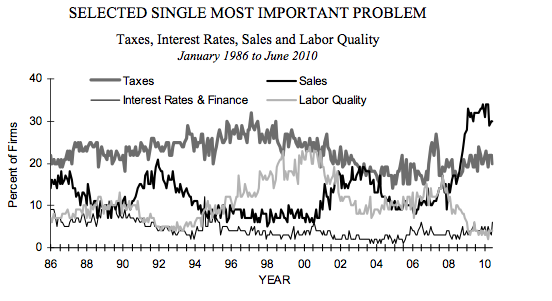 As you can see, sales - that is to say, demand for their products - dominate the chart, while fear of taxes is lower than in the '90s. The concern over sales is understandable. Not only is the economy bad. 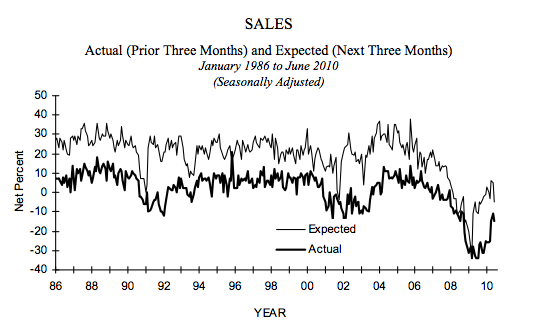 But as the next chart shows, it keeps underperforming what the businesses assume will happen.